(Beverly MA) They’ll be talking about this one for a long time in Beverly. 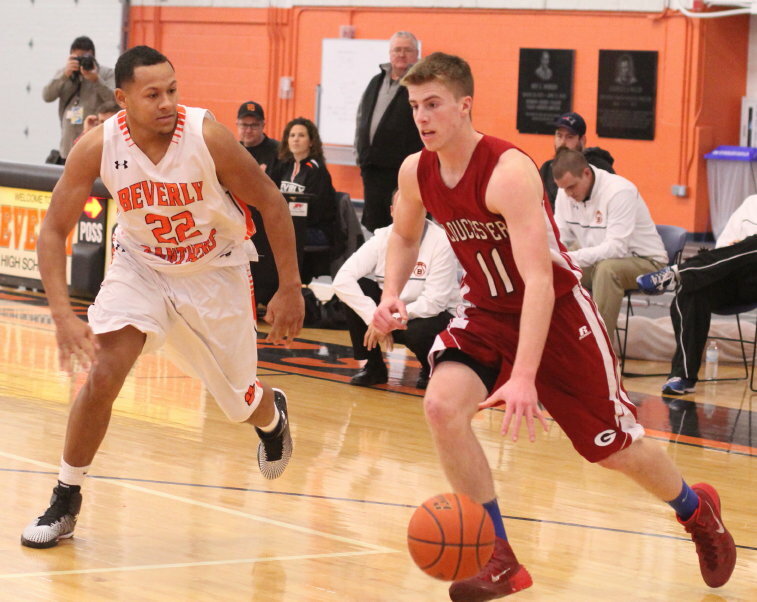 Maybe not so long in Gloucester as the Fishermen took an 85-84 double overtime loss at The Lodge in Beverly on Sunday afternoon in Northeastern Conference action. 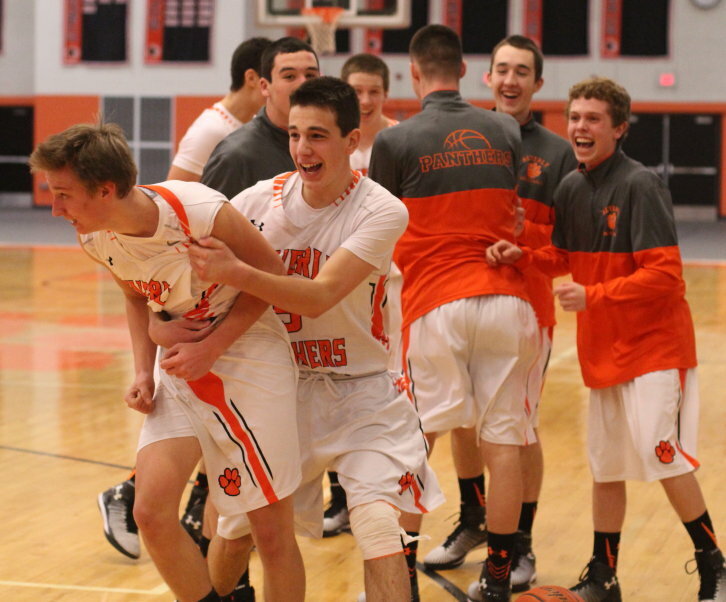 Junior Kyle Coughlin (14 points) won the game finishing a drive that was nearly full-court with one second left. Kyle doesn’t get that chance without two 3-point baskets by senior Gavin Sparkman (17 points). The last three points scored in regulation were Gavin’s old-fashioned 3-pointer. 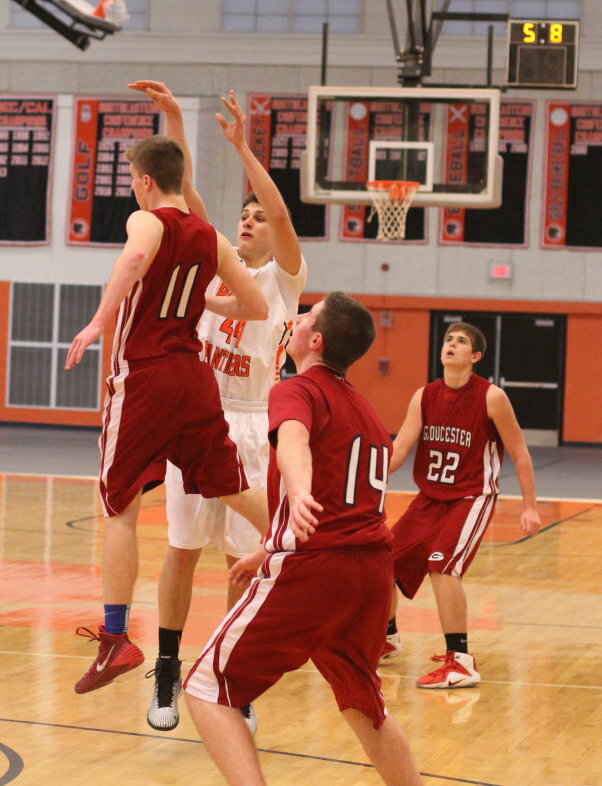 Later his three from beyond the arc with 2.5 seconds left in the first overtime erased a 3-point Gloucester lead. 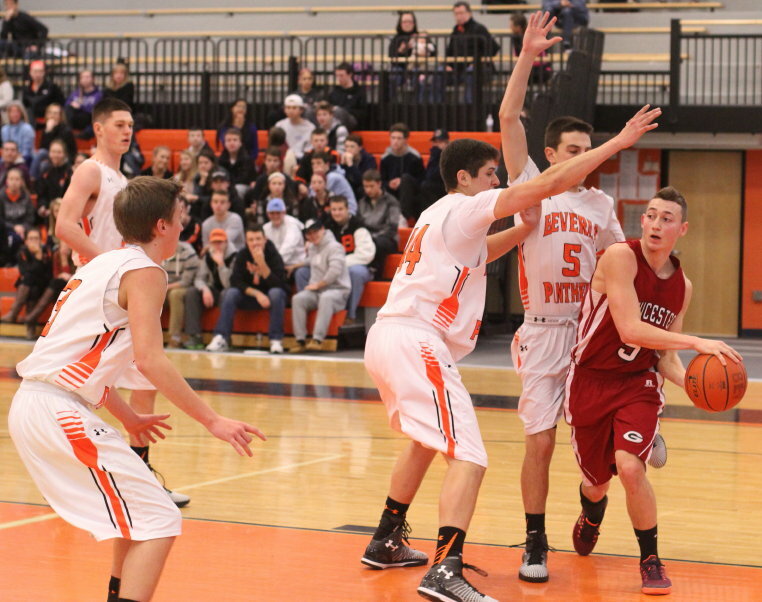 The Fishermen (8-6) had defeated Beverly, 61-46, on January 9th at Gloucester. 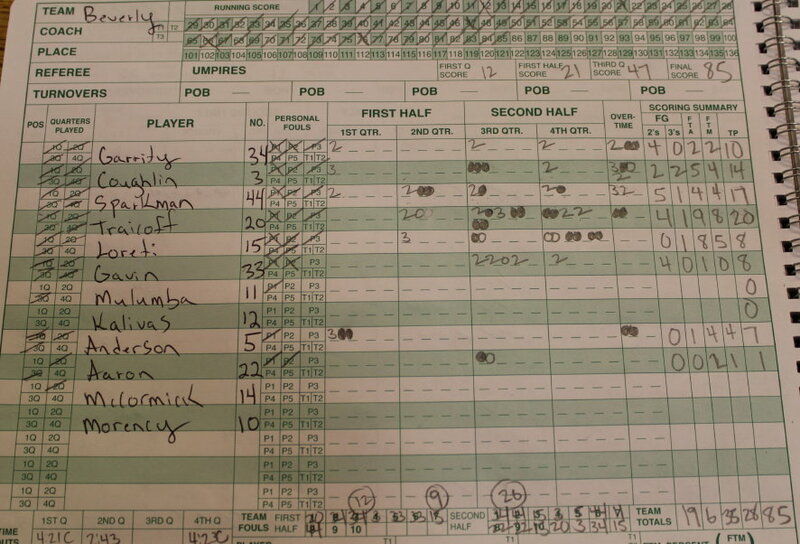 They both played at that level for a half in this game as the visitors had a comfortable, 40-21, advantage. The Fishermen point guard Alex Militello took good care of the ball and Drew Muniz (25 points) had eleven first-quarter points including three 3’s. 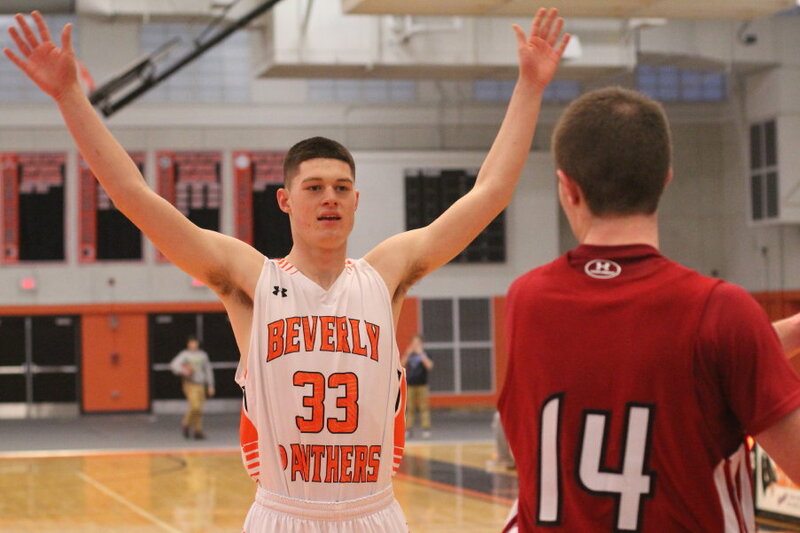 Beverly (5-8) came out after halftime and played a remarkable third quarter collecting twenty-six points. Down, 44-26, the home team ran fifteen straight past Gloucester and trailed by only three (44-41) with 3:23 left in the quarter. Pat Gavin, Sam Traicoff, and Kyle Coughlin tallied the Beverly points in the run. I thought at the time that now Gloucester was in trouble but it wasn’t until the 3-minute mark of the final quarter that four straight free throws by junior John Loreti knotted things at 59-59. The Fishermen had a 3-point lead after a Ryan Gabriele free throw with 42 seconds left but Gavin Sparkman answered with a three to send this game into OT. 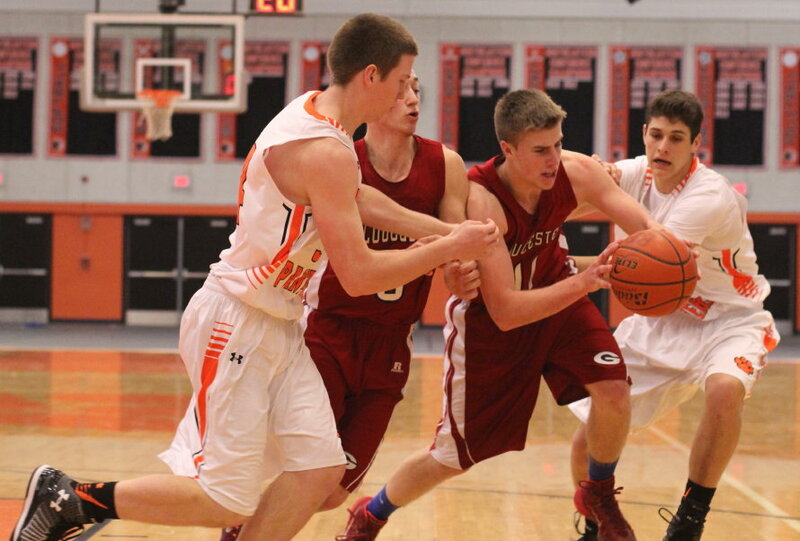 Gloucester lost two key players (Dylan Aptt and Ryan Gabriele) to fouls before the 4th quarter ended. Both players were strong on the inside. Minus them the Fishermen were vulnerable to drives to the hoop. 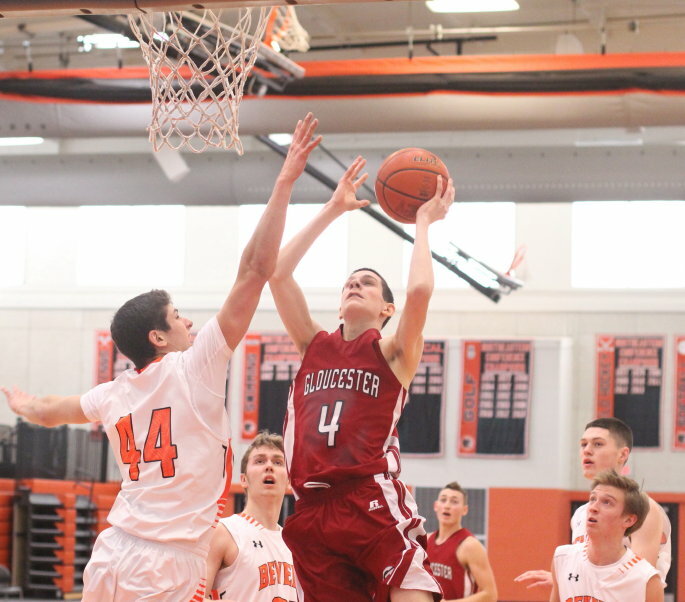 Gloucester came very close to winning the game in the first overtime. After two ties, Drew Muniz nailed a three from Alex Militello with 25 seconds left. After a Sam Traicoff miss, Drew was fouled. It was a shock to see a player who had just made a three miss two free throws. 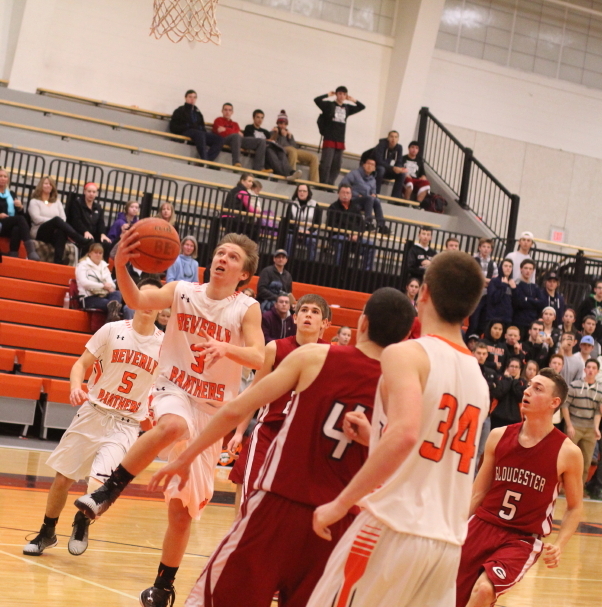 Those misses proved crucial as Gavin Sparkman tied the game for Beverly with a three from the left with 2.9 to go. The Panthers led 3-0 at the start of the game. They took their second lead of the game in the second OT on two free throws by junior Ryan Garrity and a layup by Gavin Sparkman. Back came Drew Muniz with a three to close the gap to one (80-79). 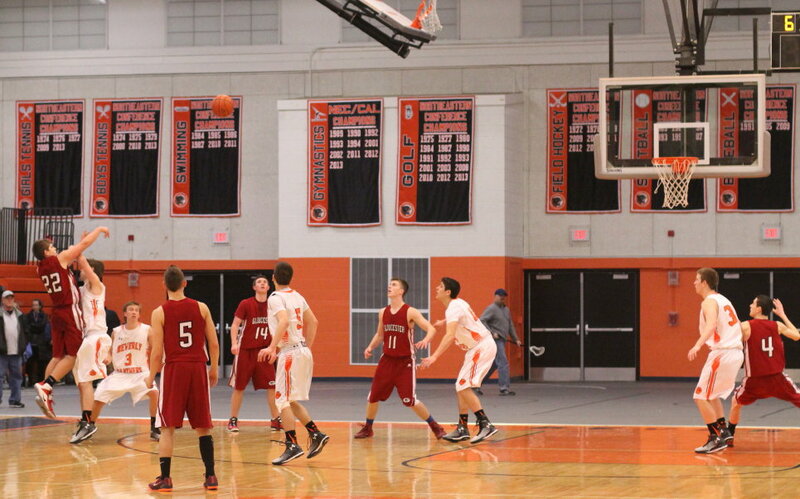 Two free throws by Ryan Anderson were answered by a layup by Drew Muniz with 31 seconds left. 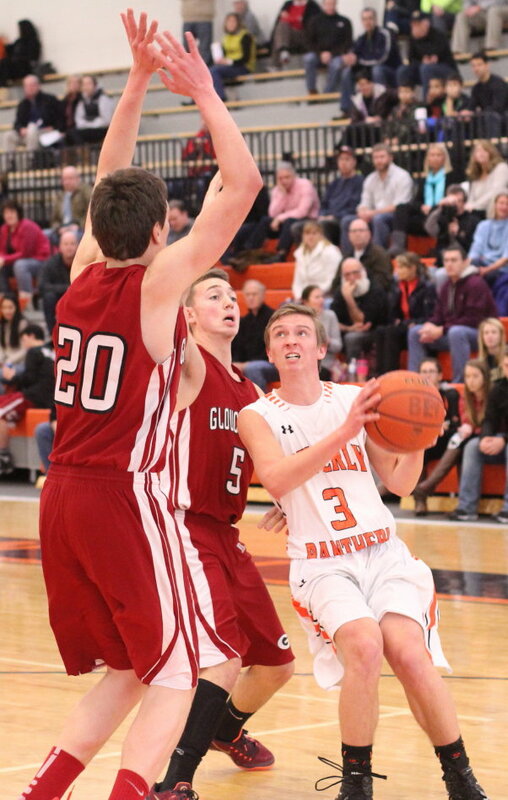 Kevin Coughlin made one of two free throws with 20 second left and Beverly was ahead by two, 83-81. There was little doubt, at least in my head, that senior Drew Muniz would be taking the next Gloucester shot. Sure enough, he tried a 3-pointer at 5.3 seconds and was fouled by Sam Traicoff. Despite having missed two straight at the end of the first overtime, the GHS senior drained all three free throws and suddenly Gloucester had a one-point lead. Talk about pressure free throws! 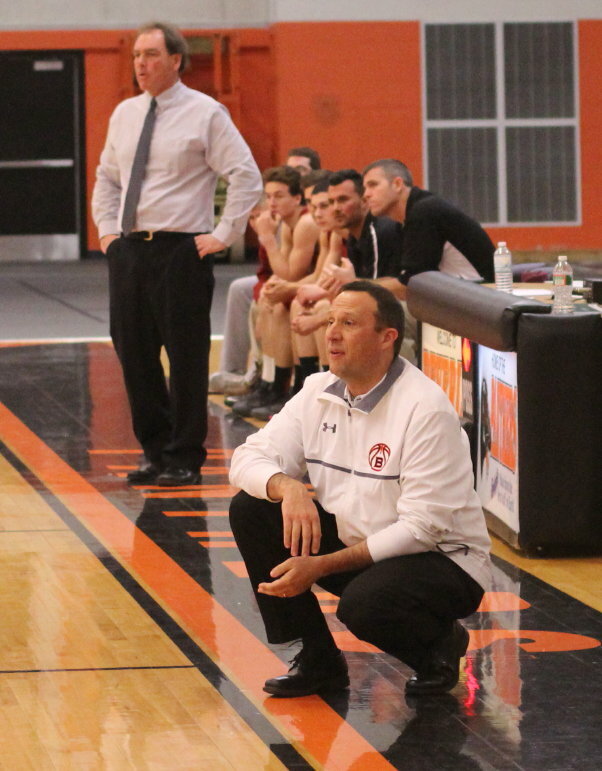 Beverly coach Scott Lewis told me afterwards that the plan was to have either Kyle Coughlin or Sam Traicoff penetrate and look to dish off in close. As it turned out, Kyle drove past Alex Militello and no Gloucester defenders stepped in. Kyle had an open lane to the hoop and was able to put in the game-winner. 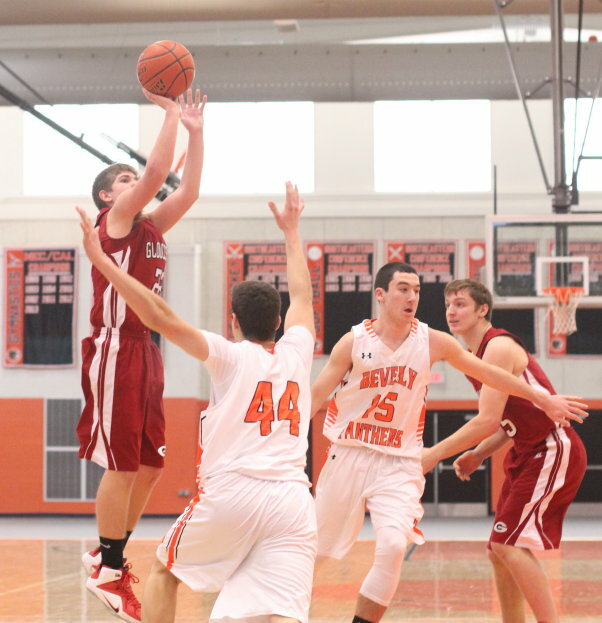 Sam Traicoff (20 points) had sixteen of those points for Beverly in the second half. 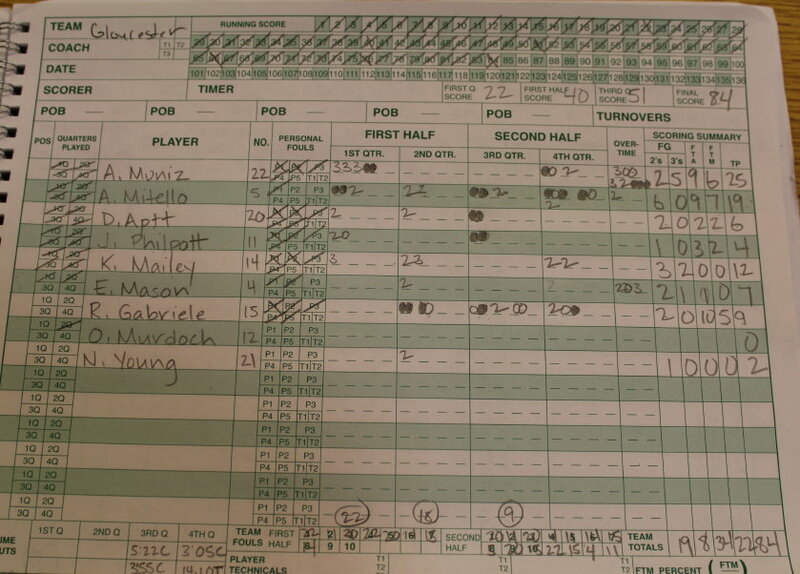 Alex Militello ended with nineteen points. He had quite a few assists especially in the first half. Gloucester had a 14-2 segment in the first quarter and twelve unanswered in the second quarter. 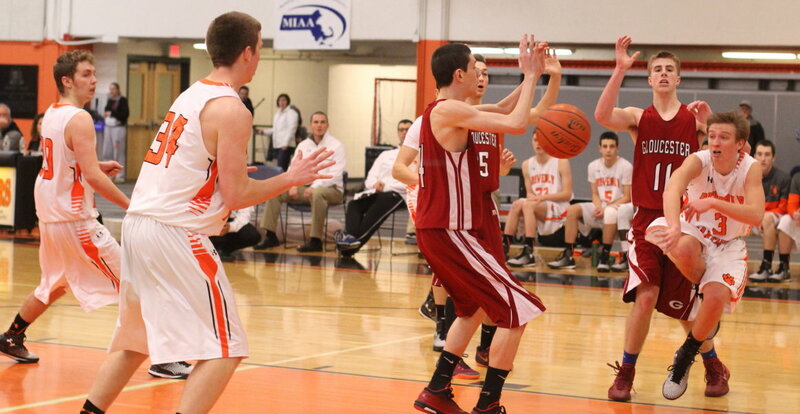 Gloucester missed twelve free throws while Beverly missed seven. 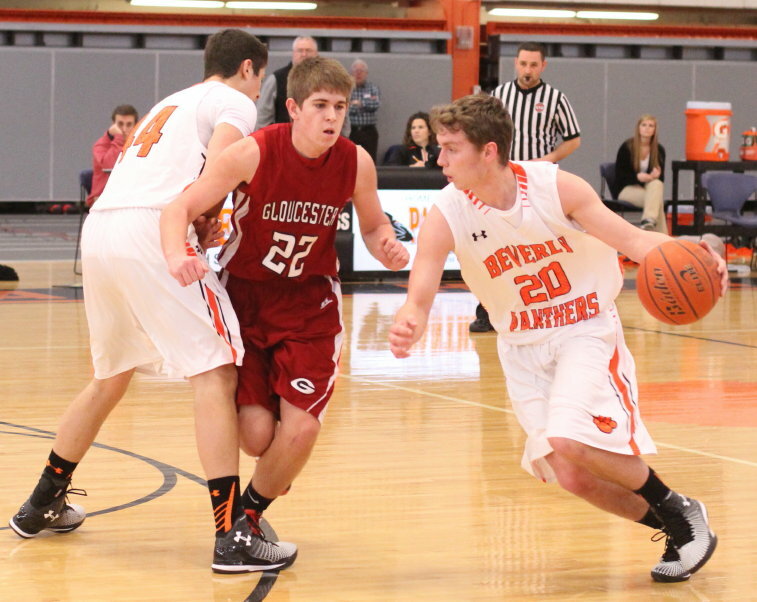 Gloucester has now lost three straight while Beverly has won four of their last five. I would tell you that both teams resume play on Tuesday but you know the forecast.